Elisa Pierrane is a Breton commoner whose husband Roderic is a big fan of the Arena. She herself can't stand the Arena, which may be why Roderic has been hanging out with Irene Metrick more than her. Her frequent visits to Skingrad give him ample opportunity to stray. They have a home in the Elven Gardens District of the Imperial City. She sleeps for eight hours from 10pm in the double bed upstairs in the Pierrane house, then goes downstairs. On the weekends, she only stays there for an hour before overcoming her distaste for the Arena and heading to the viewing gallery, spending the entire day there until 7pm. On weekdays, she stays downstairs until 10am and then heads to the Market District where she spends eight hours walking around the shops. At 6pm (7pm on the weekend) she heads home and eats a meal downstairs, then walks around the room for two hours before heading to bed again at 10pm. There are a couple of exceptions to the schedule. On the 4th of each month, at midday, Elisa heads to the Black Horse Courier offices where she was supposed to play a role in the Imperial couriers unfinished quest - she wanted to send a message to Maenlorn in Anvil. On the 18th of each month, she wakes at midnight and heads off to the Two Sisters Lodge in Skingrad. Once she arrives she will stand around until 6pm the next evening when she heads to the Chapel of Julianos and wanders among the pews and altars until 10pm, then she heads back to the Lodge. Again, she stands around doing nothing, this time until 8am the next morning and then she heads back to the chapel for another four hours. At noon, she embarks on the trip back to the Imperial City and resumes her usual schedule. She carries her house key and a considerable amount of gold, even if her wardrobe consists of cheap, middle-class items, a quilted doublet with matching shoes and a pair of tan linens. If you approach her while she is at home, she will politely introduce herself and reveal that Roderic may not own the expensive house all by himself: "I'm Elisa Pierrane. Father bought us this lovely house in the City." 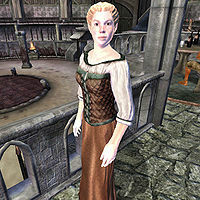 When asked about the Imperial City, she will proudly say: "Roderic is looking around for a business to invest in. I know he'll find something soon." On the contrary, if you run into her while she is at the Arena, it becomes apparent that Roderic might be investing their money somewhere else: "Aggh! I hate these disgusting Arena matches! I'm here looking for my husband, Roderick [sic]! If he loses any more of our money he's a dead man..." The shrine to Sithis located in the couple's basement may indicate that this is more than just an idle threat. Her trip to Skingrad is supposed to begin at 6am on the 18th rather than at midnight, but there is a bug in the way the game handles such AI packages that affects many NPCs.